I hope everyone had a wonderful Easter yesterday. Ours was pretty low-key, since the little man is not yet of an age to appreciate Easter egg hunts and jelly beans. Instead, I kept busy cooking while Jeremy watched a baseball game with Nolan. 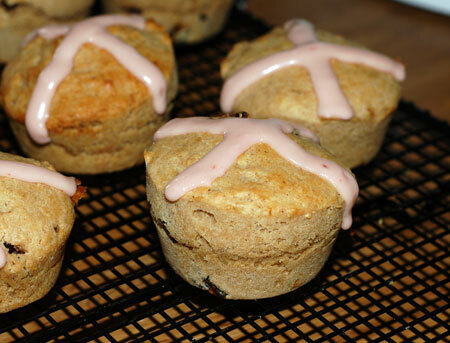 First things first: I wanted to make some sort of Easter bread this year, but I decided to go the easy route and make a quick muffin version of hot cross buns rather than the yeasted sort. I chose the recipe from the King Arthur Flour Cookbook, and afterwards noticed that their website shows a different recipe for hot cross muffins that actually does incorporate yeast. It would be interesting to try that out sometime to compare and contrast. In any case, I made a few adjustments to the recipe I used, substituting blood orange juice for rum and dried cranberries and cherries in place of the more traditional golden raisins and candied citron; I also added about a tablespoon of blood orange zest to the batter, and used the juice instead of milk in my glaze, which gave it a lovely pink color. The muffins came out alright: Jeremy and Nolan seemed to think they were pretty good, but I found them to be kind of dense and dull, never mind my distaste for dried fruit in baked goods. I noticed the same quality in the doughnut muffins I made from the same cookbook, and after a number of other mixed results, this is definitely not my go-to baking book, much as I would like it to be. For dinner, you know we had to have lamb. I’ve been braising most of our legs these past few months, so I mixed it up this time and did a roast. We get the boneless ones from Costco, so I smeared the inside with rosemary and garlic mixed with a little olive oil, tied it up, and slathered the outside with a mixture of softened butter (3 T), Dijon mustard (1 T), and rosemary (1 T); then it went in the oven at 450F for almost an hour and a half. Seems like our poor little oven always takes longer cooking big cuts of meat than the resources suggest. While it rested, I made a quick jus by deglazing the de-fatted pan drippings with white wine and a bit more Dijon, and threw on some potato pancakes to go with the meat. The idea was that the shredded potatoes were reminiscent of nests (or Easter grass, or whatever), in an abstract sort of way, at least. To save myself some dishwashing from another side dish, I sliced up and blanched a fistful of asparagus spears, chilled them in an ice bath, and mixed them into my potatoes. It worked out well, and the asparagus got nicely caramelized where it touched the cast iron. Next time, my only adjustment will be to slice the asparagus on a steeper bias, because the little chunks I cut sometimes escaped while shaping and flipping the pancakes. 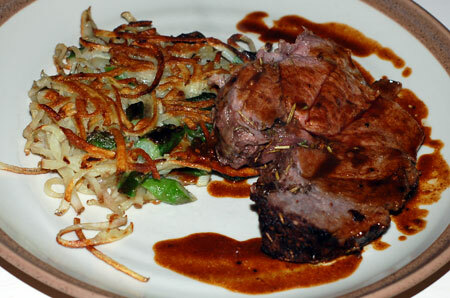 Nolan liked the lamb and loved the potato pancakes, last night and maybe even more today, as leftovers. Boil a small pot of salted water and cook the asparagus just until they are tender when stabbed with a fork, 2-3 minutes. Remove to an ice bath, chill, and drain. Combine the eggs, flour, salt, and pepper, stirring to blend. Squeeze out as much liquid as you can from the potatoes and onions. (You can just use your hands, or, as I do, load some shredded potato into your ricer with the smallest holes and squeeze. Once you’re done, you can poke at the potato starch that settles at the bottom of the liquid–entertaining!) Add the potatoes and cooled asparagus to the egg mixture, mixing well; hands work well here. In a large cast-iron skillet, heat some of the oil over medium-high heat. Spoon the batter by quarter-cupfuls onto the hot skillet, flattening them with the back of the spoon. Fry until the bottom of the pancakes are nicely browned – between 3 and 5 minutes; flip the pancakes and cook for about 3 minutes longer. Repeat for the remaining pancakes, adding oil to the skillet as needed. Drain on paper towels, salt while hot, and serve immediately. Source: Adapted from Bette’s Oceanview Diner.